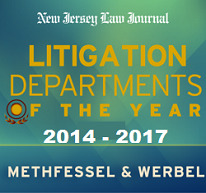 James H. Foxen joined Methfessel &Werbel in 2012 following a clerkship with the Honorable Alvaro L. Iglesias in the Hudson Vicinage of the Superior Court of New Jersey. Mr. Foxen’s primary responsibility was reviewing motions and making recommendations to the judge regarding final disposition. While serving his clerkship, Mr. Foxen wrote legal opinions disposing of complex criminal matters and assisted in rulings on matters including criminal law, family law, and evidentiary issues. During his clerkship, Mr. Foxen participated in the mediation of diverse family law issues including custody and child support disputes. Mr. Foxen also mediated civil matters. While attending law school Mr. Foxen was a member of the Children’s Justice Clinic and the Domestic Violence Clinic. Mr. Foxen was also a summer law associate at Lester, Schwab, Katz & Dwyer where he gained experience in commercial litigation and insurance defense. Mr. Foxen is a member of the general liability team at Methfessel & Werbel and practices under the direction of Paul J. Endler.